Winter is here and where would be much more perfect than spending the holidays in a place of paradise that you can take shots of yourself in the glimpse of the spectacular chilling scenery? Korea is not just the home of our fancy, gorgeous kpop oppas and noonas, but it is the perfect platform for reasonable items (hi, soju) and magical places too. A place of awesome shopping, warm finger food and taking shots of soju, Korea offers lots of activities and remarkable destinations to lift up the Christmas vibe. The snowy mountain of Seonjaryeong is place particularly for adventurous travelers and hikers who are willing to push the limit in overcoming the chilling breeze to get to the peak of the mountain for a fantastic view. Visualise it as an adventure beyond the wall as a brother of the Night’s Watch. Nami Island is an exceptional destination for cool shots and must not to be missed during your visit to Korea. The nature environment is worth the shot for your Instagram regardless summer or winter season. Fancy riding horses in the snowy landscape and cold mountains? Jeju Island is the place where you could get fresh seafoods captured by those ahjummas on the day and can be eaten raw on-the-go. Besides riding the horses and visualising yourself as Jon Snow, there are mountains such as Songak-san and Seongsan Ilchulbong that you could hike in the least amount of time to get the mesmerising breezy view of the island. Seoul Plaza is the centre of main attraction when it comes to the winter season, having to transform into large ice skating rink every winter for the residents and tourists to have the time of their lives while embracing the cold winds. 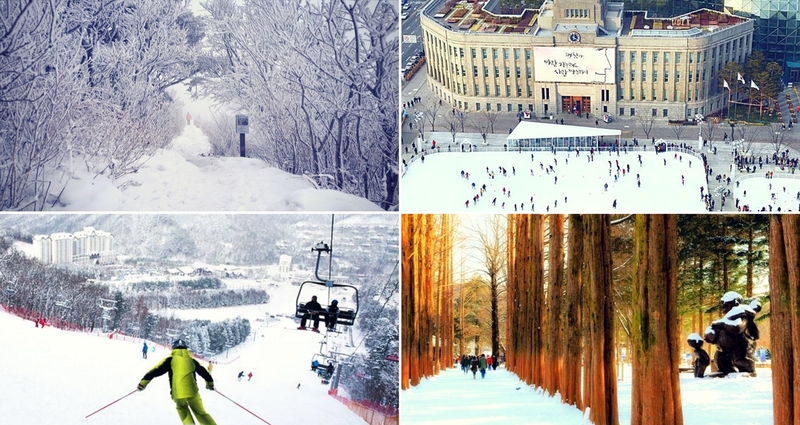 Have perhaps the once in a lifetime skiing experience especially for us Malaysians, in the largest snowboard resort of Korea. Or you can just play snowball fights amongst yourself there while having the night off at the hotel resort. If you more keen into the world of the Western culture, then hop on the journey to Paju’s Gyeonggi English Village to have the westerny Christmas feels during the jolly, joyful festive season.